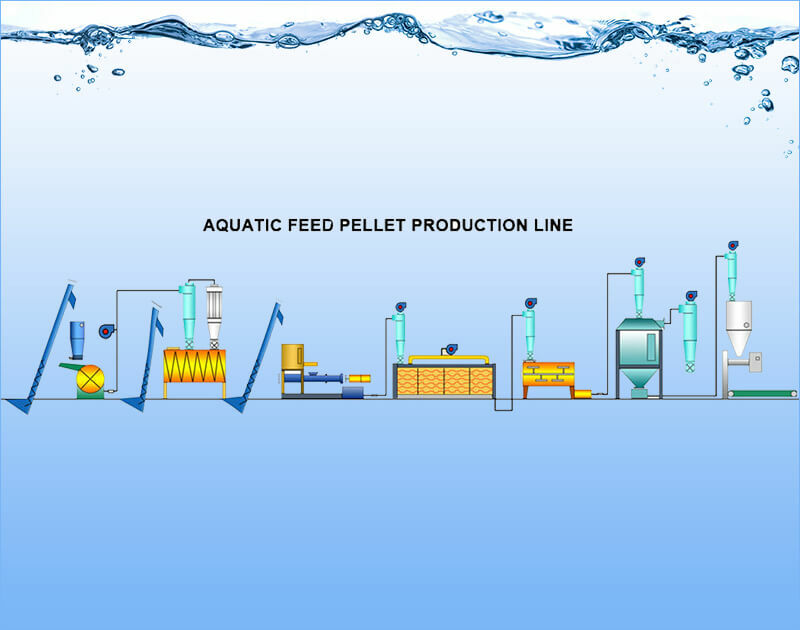 Our fish feed pellet production line is the complete procedure of feed pellet production with capacity of 300-400kg/h. This line is designed for making commercial pellets from corn, maize, grass, grains, protein, molasses and so on, and final pellets with different shapes, unique flavor, rich nutrients and fine texture, are widely used as aquatic and pet feed like goldfish, tropical fish, catfish, shrimps, dog, cat and etc.. Super automation control, high production efficiency, our fish feed production line is the best choice for medium and big sized feed mills and breeding farms. Complete pellet production lines with different capacities are also available to meet customers’ specific demands. 1. A wide range of raw materials such as corn, wheat bran, paddy, soybean meal, paddy rice, sorghum, etc. The raw materials is experienced by the high temperature and high pressure, which can kill the salmonellosis and bacterial infections. 2. 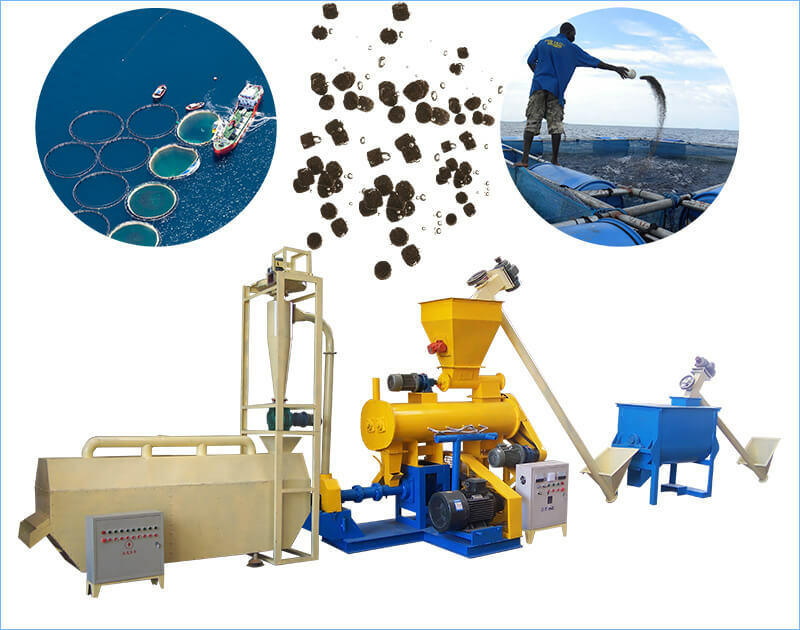 Besides floating fish feed and sinking fish feed, this production line can also produce high quality feed for pet like dog, cat and etc., applicable for fish farm holders and pet feed manufacturers. 3. The diameter of the pellets can be from 0.9mm-15mm. 4. Capacity: 300-400kg/h. We can also customize different fish feed pellet plant depending on your raw materials and specific requirements. Raw materials first are crushed by the fish feed crusher. The particle size directly effects the efficiency of pellet making. Once feeding into the crushing chamber, materials are smashed under the high-speed rotation of hammers. With the high pressure and rapid-moving of airflow, the smashed raw materials are further reduced into particle size or very small pieces for further processing. Therefore fish feed hammer mill is suitable for fish feed pellet grinding in the production line. Powdery feed materials need to be mixed thoroughly in the mixer to ensure a high-quality of nutritional feed. We provide feed mixer with a single-shaft and twin-ribbon. It reinforces convection, shearing, and mixing effects and is an essential parts of the whole line. After mixing, feed pellet extruder will compress feed powder into sized pellets. Dry type fish feed extruder is the significant equipment with reliable performance, easy operation and cheap price, which is economic for small and medium scale production. 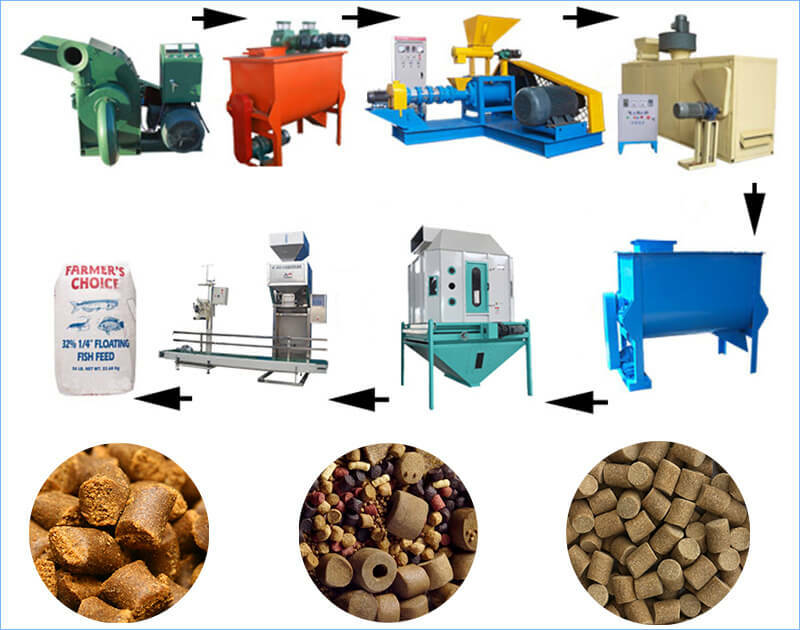 Therefore dry type feed pellet making machine are recommend in the feed pellet plant. Notice: Wet type feed extruderwith the conditioner can also produce high quality pellets in large capacity, which suits for large fish feed factory. Fish feed pellets from pellet making machine need to lower high moisture and temperature. So mesh belt dryershould be equipped in the production line. With simple structure, it is easy to install and maintain, and ideal for fish feed pellets drying. For acquiring better smell and taste, the oil spraying machine can be used to spraying oil to the surface of fish feed pellets coming out of the dryer. It sprays atomized oil with high speed on the up and down surface of pellets, and the excessive oil can be recycled through filter. Hot pellets are soft and easily broken, which can result in a high percentage of fines. By cooling pellets can be harden. Counter flow cooler is cooling type that commonly used in pellet industry currently with the direction of the air and product of pellets in opposing directions. The fish feed pellets are packaged in bags for further transporting and storage. Here you can opt pellet packing machine which is suitable for weighing and bagging pellets. Using packaging machine can increase productivity, reduce labor intensity and satisfy the needs of large-scale production and meet hygiene requirements.